Rogue was Nissan’s best-selling light vehicle in U.S. in 2018. Nissan at its third-quarter financial results meeting in February did not offer details about how it plans to fix operational problems which forced it to lower its full-year fiscal 2018 sales and earnings forecast by 3% and 17%, respectively. TOKYO – As Nissan approaches the March 31 end of the Japanese fiscal year, the automaker’s future remains uncertain with both strategic and operational questions still to be answered in the wake of the November arrest and firing of Carlos Ghosn, its chairman and before that president and CEO. 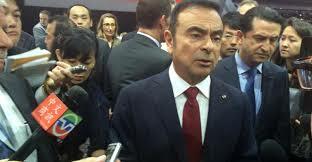 With Ghosn (below, left) released on bail March 6 after 108 days of confinement, Nissan now faces another problem. Ghosn apparently wants to talk to the media and, based on the reputation of his lawyer, Junichiro Hironaka, is expected to mount an aggressive defense. Ghosn and Greg Kelly, an American executive on Nissan’s board, were arrested Nov. 19 in a sting operation, both removed from their planes and taken to the Tokyo Detention Center. Kelly was released on bail Dec. 25 after five weeks in solitary confinement. He is awaiting trial although no date has been set. Both Kelly and Ghosn are charged with conspiring to falsify official financial reports regarding deferred compensation for Ghosn. Ghosn additionally has been charged with aggravated breach of trust regarding various financial dealings, some dating back to the 2008 recession. Nissan did not respond to a Wards request for information regarding the alleged crimes. Meanwhile, Nissan’s current CEO Hiroto Saikawa and Mitsubishi CEO Osamu Masuko met in mid-February with Renault’s new chairman Jean-Dominique Senard. Few details about the meetings were revealed other than a general reaffirmation of the importance of the “alliance” among the three automakers. No decisions were made about who will replace Ghosn as Nissan’s next chairman and whether there will be a change in the equity structure of the alliance. Renault currently holds a 43% stake in Nissan, which in turn owns 15% of Renault and 34% of Mitsubishi. Nor did Nissan at its third-quarter financial results meeting in February offer details about how it plans to fix operational problems which forced it to lower its full-year fiscal 2018 sales and earnings forecast by 3% and 17%, respectively. Nissan is projecting operating income of ¥450 billion ($4.1 billion), an 8-year low, on revenues of ¥11.6 trillion ($10.0 billion), the lowest level since fiscal 2014. 1) If the automaker meets its revised fiscal 2018 forecast, it will register a 3.9% operating profit margin, the lowest since fiscal 2008, the year of the recession. Moreover, if operating income falls to ¥450 billion it would the lowest since fiscal 2009. Koji Endo, an auto analyst at SBI Securities, reports Nissan’s operating margin in its auto business (excluding auto leasing) is less than 1.5%. Nissan’s 3.9% profit margin would be lower than all other Japanese automakers except Mazda. Toyota is forecasting 8.1% and even alliance partner Mitsubishi, which is still recovering from a mileage-cheating scandal three years ago, is on track to achieve 4.6%. 2) In North America, Nissan registered ¥114.9 billion ($1.0 billion) operating profit, up slightly over the previous year’s 9-month total and on track to reach ¥153.2 billion ($1.4 billion) but still 60% below peak levels of three years ago. Nissan, meanwhile, reported a 9-month deficit of ¥24.2 billion ($220 million) in Europe. Earnings in Asia, including China, grew to ¥54.2 billion ($490 million) but were not enough to offset shortfalls in Europe and North America. 3) Market share in North America and Europe fell while increasing in Asia and Japan. Globally, Nissan reported a 5.9% share of 68.8 million light vehicles sold in the April-December period. In fiscal 2017 (full-year), its share stood at 6.2% of global demand of 93.5 million units. Saikawa does not detail how the automaker intends to improve earnings in the all-important U.S. market, other than a general comment about “enhancing brand value.” It appears Nissan will place less emphasis on achieving market share and more emphasis on profit margins. 4) Nissan registered sales declines in 12 of 22 markets covered in the earnings report including the U.S., which registered Nissan and Infiniti sales of 1,077,874 units, down 8.4%. Nissan registered volume gains in China, the automaker’s largest market, up 7.4%. Other countries registering growth included Japan, Canada, Russia, Brazil and Thailand. 5) In line with sales, global production fell, 3.6%, to 3,996,576 units. Nissan’s full-year forecast is 3,997,000 units.